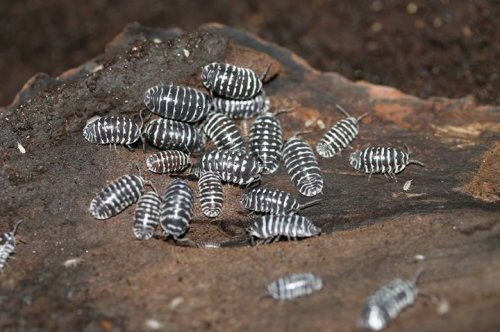 Up for auction is a starter colony of 20 mixed size "Zebra Pillbug" isopods. * They make great feeders for small amphibians/reptiles, insect/arachnid pets . . . and carnivorous plants! * They can be used as "clean up crews" for many larger arachnids and reptile/amphibian tanks. * They make great pets and are educational for kids! A 5 gallon container or aquarium easily houses a large colony. They need a moist bedding of coconut 'core' or other moisture retaining substrate. Give them places to hide under, like cork bark and other pieces of wood. They mostly eat hardwood leaves but need supplemental feedings, such as pieces of fish food, fruits and veggies. I keep mine at room temp with no supplemental lighting (they often hide from light). This species likes to burrow and will often dig down about an inch deep. Make sure to look at my other Isopod listings! Last edited by Acro; 04-08-2019 at 06:21 PM. Reason: Added links. Local delivery will take place on Thursday the 18th or Friday the 19th. I found a young Ambystoma maculatum!